Following the success of the first two editions of its Corporate Communications Pitch Competition (CCPC); Sesema Public Relations, a leading Public Relations and Marketing Communications firm in Nigeria is calling for entries for the third edition of its competition. In line with the second edition, this year’s competition will be in two different categories; Public Relations and IT/graphics design. The grand Prize is Six (6) months paid internship which may lead to full employment and a cash prize which increased this year to the sum of One Hundred and Fifty Thousand Naira (N150, 000) for each category. As part of the selection process, applicants for the PR/COMMUNICATIONS CATEGORY are requested to write an essay on “What PR tactics can be used to change the negative perception of a government administration willing to run for second term” while applicants for the IT/GRAPHICS DESIGN CATEGORY will be required to “Redesign the logo of an existing telecommunications company in Nigeria”. Previous editions of the competition have produced winners who are doing exploits in the Corporate Communications industry. 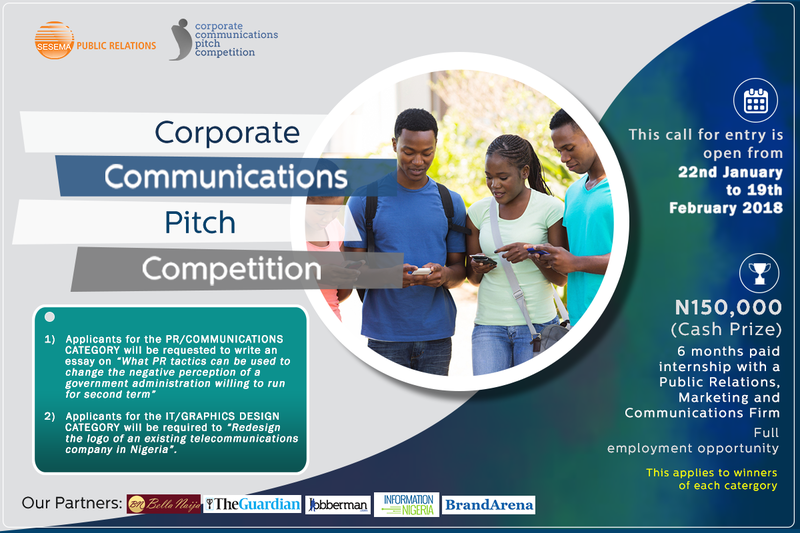 The Corporate Communications Pitch Competition is supported by Guardian, Jobberman, BellaNaija, Information Nigeria and BrandArena. Essay should be between 500-1000 words. Name, course of study and essay topic must be clearly inscribed at the top right hand corner of the document. Possess a minimum of second class lower degree in Mass Communication, Public Relations, English language, Communications and Media Studies, Advertising or any other related field. Have a background in Computer Science, Information Technology or any other related Field. Any application submitted outside the specified time frame will not be accepted. N.B: Winners of the competition must be available for the six months internship program. 0 Response to "Sesema PRâs Corporate Communications Pitch Competition call for entry extends to 19th February, 2017"